Hidalgo County Sr. Deputy Ricardo Garcia gives instruction to teachers and faculty during a Sharyland ISD active shooter training at Ruben Hinojosa Elementary School Friday, Aug. 24, 2018, in Mission. ALTON — Teachers and staff at Jensen Elementary looked around the cafeteria Friday morning wondering how to secure the doors and gain at least 120 seconds that could save lives. A viable answer came to a cafeteria worker, who looked for a large trash bag to wrap around the two large metal handles of the double doors leading to a main hall in the school. The double-knotted reinforcement may not have been impenetrable, but it could keep a shooter out of the room long enough to allow police to act. 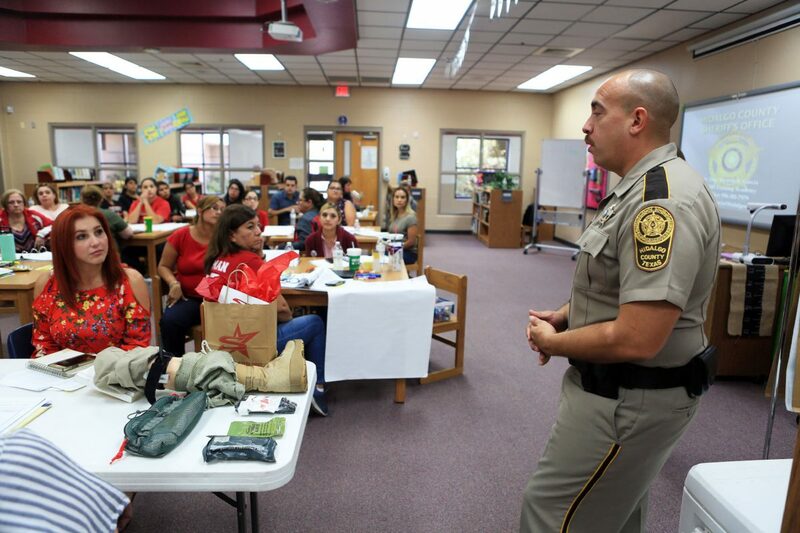 Throughout the week Sharyland school district campuses underwent an active shooter awareness program conducted by the sheriff’s office as part of back-to-school preparation. 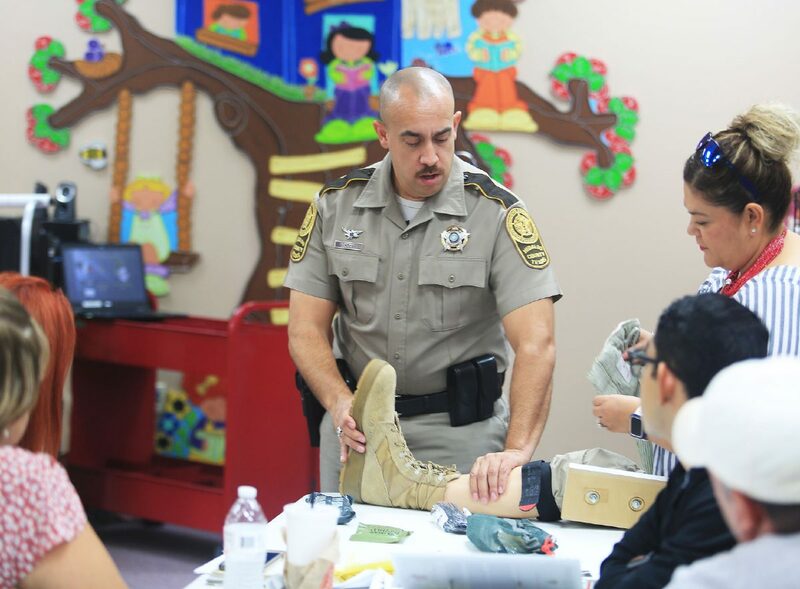 Using a prosthetic, Hidalgo County Sr. Deputy Ricardo Garcia shows how to stop a wound from bleeding out to teachers and campus workers during a Sharyland ISD active shooter training at Ruben Hinojosa Elementary School Friday, Aug. 24, 2018, in Mission. 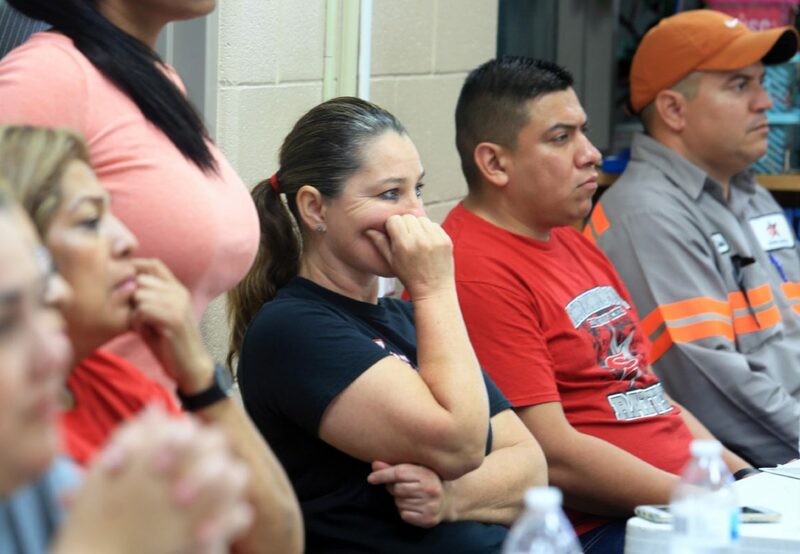 Teachers and campus workers listen during a Sharyland ISD active shooter training at Ruben Hinojosa Elementary School Friday, Aug. 24, 2018, in Mission. 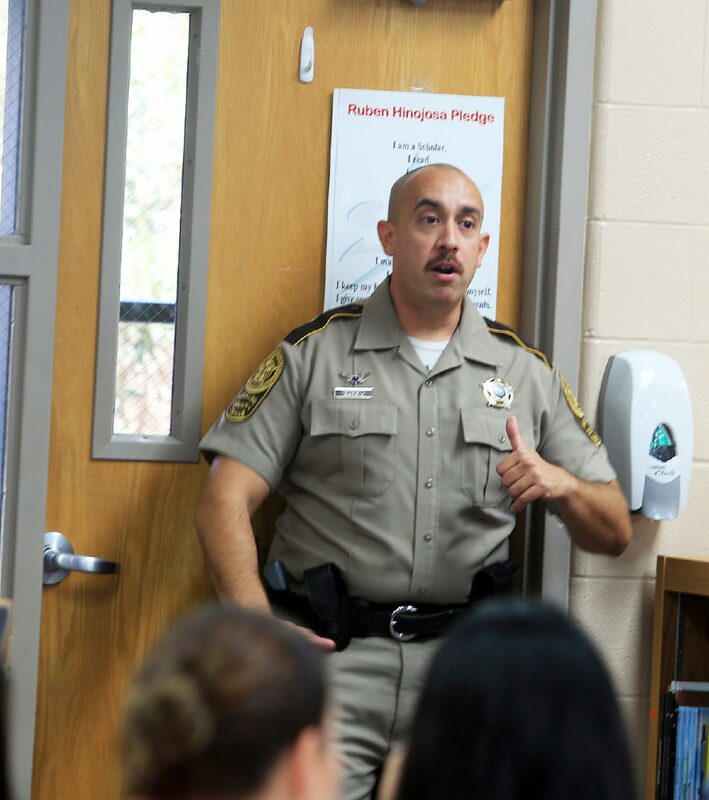 Hidalgo County Sr. Deputy Ricardo Garcia talks about ways to secure a door for faculty during a Sharyland ISD active shooter training at Ruben Hinojosa Elementary School Friday, Aug. 24, 2018, in Mission. Rather than providing a specific step-by-step plan, the training was meant to create a change of mindset so that the entire school is aware of its surroundings and options in case of an active shooter situation — from incorporating deterrents such as strong signals that all visitors are monitored, to having a plan of action on how to secure students if trapped inside or outside the campus, and knowing how to act as first respondents if needed. The presentation that Garcia led throughout at all Sharyland schools started at the top with the school board members, he said, as there is no way he would commit to a district in which leaders are not involved and aware of the process. And this is the same presentation he’s taken to other neighboring districts such as Mission, Pharr-San Juan-Alamo and Progreso. The presentation started with a history of traumatic events that have ended the lives of many students throughout the country. Garcia pointed out that a big change throughout the years has been the revelation that shooters have been learning from their predecessors and evolving their techniques. So this is why the same has to be done to combat them, he said. Every single teacher was given homework, becoming better aware of their surroundings, developing a plan of action and calling him back to assess said plan. As hard as it might be to think these teachers and staff must act as the initial response in case of a shooter, Garcia said this is the inconvenient reality America now faces. The message really hit a nerve for Jensen Principal Niranda Flores, who immediately after the presentation asked Garcia when he could come back to assess their progress. It’s definitely scary to come to the realization that there is work to do to reach a level of safety that matches these kinds of dangers, Flores said. The training through the county sheriff’s office, Garcia said, and those interested in an assessment of their school district, company or building may call (956) 381-7979.